A semitrailer unloads coal at the SIU Power Plant. Voice of The Southern: A future without coal? Monuments, museums, festivals and celebrations herald coal’s contribution to making Southern Illinois a prosperous place to work and live. The Old King Coal Festival today will wrap up its 75th annual celebration, which honors coal miners and reminds us of the coal industry’s importance to the region. “We believe Illinois coal is part of the solution for energy,” Bradley said Tuesday at a news conference announcing the legislation. Except that his bill wouldn’t really create that state fund. It’s more of a plan to create a plan than anything else. Simply stated, it "authorizes” the Illinois Commerce Commission to find a way to fund scrubbers. No problem. At a cost of nearly $250 million each and few other financial priorities in the state, the ICC should have no problem. An end to K-12 funding proration … or scrubbers? Funding higher education beyond the 31 percent allotment approved a few weeks ago … or scrubbers? $700 million for human services … or scrubbers? A little recent history on the coal industry: Peabody, the world’s top private coal mine, declared bankruptcy last month. American Coal announced its most recent round of layoffs in February, when it laid off 101 employees. A week before that, Alliance Resource Partners LP announced layoffs at Hamilton and White county coal mines. Peabody laid off 75 people from its Arclar Mine Complex near Harrisburg a week before that. Occupational employment estimates from the Bureau of Labor Statistics suggest that in 2015, Illinois employment in mining, quarrying, and oil and gas extraction was down to less than 10,000. Across the entire United States, coal mining now employs fewer than 57,000. On Saturday, the Old King Coal Festival hosted a rally of the “Coal Miners Movement” at its main stage. The newly formed advocacy group, whose slogan is “Make coal great again,” seeks to support laid off coal miners. Make coal great again. We wonder where they came up with that motto? Southern Illinoisans are wounded by the decline of the coal industry. We understand. But there is a finite amount of coal. No one disputes this. At some point, coal jobs in Southern Illinois will go away entirely. Your legislator cannot — or will not — admit that. We admire the Coal Miners Movement’s dedication to advocating on behalf of unemployed coal miners. We applaud any legislator’s genuine attempt to support people in his or her district. The loyalty to coal is more than understandable. It put food on our tables for generations, ensured children had presents under the Christmas tree and served as the foundation for nearly every Southern Illinois community. Our ancestors were trailblazers who risked and lost their lives venturing into the darkness to keep their families fed. But the question we have to ask now is, are we truly made of the same mettle they were? Do we have the courage to move on? Or do we cling to what’s safe while the region becomes lost in the shadow of progress? Let’s choose to look forward. Voice of The Southern: Protesting what? Who cares what happens to the industry! If it continues to remains all white nothing but bad will come! An it already has! Seems that the vast majority who apply for these jobs are white....because it is hard , demanding work in dangerous places. I wonder how many on the taxpayers dole will survive without the taxes coal and miners pay ? And yes , I also mean the students who constantly demand more and more freebies! Schools in general always demand MORE , I'm curious. ...where does this $ go? More committees , seminars , administrators, $100 million schools , stadiums , etc? Always MORE , never a carr about those who have to pay for YOUR MORE ! Look, regardless of how much coal there is in Southern Illinois, many people world-wide think coal has poisonous side effects. True or not true, that will not change. Whether you believe global warming is real or not, the majority of countries world wide and the US military, who is planning for global warming, do. That wont change. No amount of PR or anything else will work. Tobacco used to be huge in this region and Nation wide, and thousands upon thousands of jobs were lost as demand dropped due to the hazards of smoking. The same was true with black-smiths. That's just reality. You cant force something to be bought if it has a side effect, perceived or not. Even if the burning of coal gave off ice cream, it is CRAZY to bank on one industry anywhere. Why aren't our politicians trying to get other big businesses like an automobile plant or a some other type large job creating business in this area. You don't put all you eggs in one basket. Southern Illinois has hard workers, cheap land, interstates, railroads, two of the larges rivers in the world, and a major university. You would think a good sales job by a Politician doing what they are paid for would get a businesses like Google or Microsoft or Tesla here. So - what's the deal? Who cares what happens to coal in Southern Illinois! Coal Operators are racist they do not! and will not hire Black Americans! Its too bad that white people think every thing belongs to them! Just sad that nobody will do anything to penalize operators for their racist tactic's! 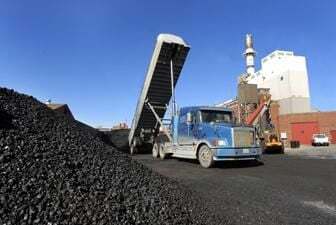 Southern Illinois Coal is racist and lilly white! An it needs to be shut down! The revelation of the Southern that coal should be abandoned appears to have been made with no knowledge of the coal or power generation industries. Just one point, scrubbers do not remove CO2, which is the greenhouse gas driving the push to eliminate coal burning. Also, elimination of coal power plants in the US is being rendered insignificant by the 600 new coal power plants being constructed in China, India and other eastern countries. Are these editorials being farmed out to junior high school students? "But there is a finite amount of coal. No one disputes that." Let's overlook the poor sentence structure and take on the premise. Yes "finite" as in 250 years of recoverable reserves in Illinois alone. Finally, the "courage to move on" lest we become "lost in the shadow of progress." Huh, what? Are you claiming that this region is held back because coal is mined here? When you are ignorant about an issue, it is best to keep that to yourself. How embarrassing for you. For those of you that do not have an open mind about Obama....he said, before the election, that he would destroy the coal industry in America. This is one promise he kept. He has destroyed one institution after another since elected. He does not love America first. Why is that? Could it be that he is simply not an American. One does not like to consider that possibility. He was elected by people that did not vet him, did not research him, did not examine his mentors, his communist beliefs, his muslim upbringing, his radical agitator mindset, etc. America has always been prepared to repel an outside enemy....we did not expect one from the "inside". I don't know about you, but he's as American as I am. He's no more an enemy of America as you are. Your aversion to human progress sort of makes you seem less evolved than most of us, but not less American. Has he come for your guns, yet? What kind of "human progress" do you refer to in the conclusion of your post? Coal is being displaced by natural gas. NG is cleaner in the conventional sense and does not produce as much greenhouse gas pollution. I'd figured coal exports would increase as China, India and other countries developed. But even China is switching to NG and has signed a big NG contract with Russia. If we run out of NG someday it is unlikely we will switch back to coal as by then other technologies will be more competitive. Maybe with CO2 sequestering coal could become viable again, but I would not count on this. I do think we owe former coal miners and other coal industry workers for their many years of service. A tax on NG and/or gasoline could be used to help people retool and help communities keep their schools running and their water clean. The fracking revolution was created in part by government funding for basic research. The oil companies did not do it on their own. So, it is reasonable that public funds be used to help those being hurt even as most of us are benefiting from the new technology of fracking. Yahoo I am a 3rd generation coal miner my family has been mining coal in southern Illinois for 100 years! It's not dirty coal but dirty politics! In the 1990's the U.S. Government destroyed the union coal mines and in 2016 the U.S. Government is shutting down the non-union coal mines! Antichrist Obama's war on coal is for his leftie meanie-greenie machine! The coal mines built the towns around here and until the people get behind Old King Coal to grow and until united we stand and divided we fall Old then King Coal will go on the coal mine throne one more time! If Old Coal king bites the dust then your electric bills will triple' blood in the streets, riots and Martial Law is what Antichrist Obama wants! Yahoo may Jesus bless the dearly beloved Coal miners forever! Where does this $250 million figure the editorial board proffers come from? If not scrubbers, what other pollution control devices can be used at a smaller cost? The bottom line is Illinois coal is rich in sulfur content which makes it even dirtier to burn than other types of coal. Not to mention the EPA argues that adding scrubbers results in job growth in the construction sector. Looks like just another Jim Muir rant to get the rubes all riled or the usual Obama haters like CO all riled up to me. Great comment J! You are the poster child for abortion rights! Says the person who called Dr Ben Carson "an idiot." These "rubes" made a living for their families that you can only dream about! MickeeD...don't hate Obama! Don't like his policies! Don't like his anti-America stances! Don't like his giving the bomb to Iraq! Don't like his destruction of American health care! Don't like the cost of ObamaCare! Don't like his bowing to America hating dictators! Don't like his attitude (actually core belief) that America is the major problem with the world! Don't like his pushing perversion! Until 2008 most people knew which bathroom to use! Now they don't thanks to him. Don't like his EPA! Don't like his economic policy that put 95,000,000 out of work! Don't like his transfer payments to Communist China for "windmills". Don't like his failed transfer payments for various solar "experiments" that are just funnels for money to his cronies! No, I don't like his policy to savage coal miner workers and their families and their communities! Who would? Do you? Mickee: Drugs are bad, mmmkay. Pot too. The death of coal is greatly over rated in 2016. This was a government decision pushed by radical leftists and the current President. When he leaves office work will begin to right the ship which is now listing in the water dangerously near sinking. This is true of all major American institutions which have been savaged by this man. He has weakened America including the military. I'll leave it to you to determine why he has done this. Windmills are not the answer to energy. They cannot, have not and will not be able to stand on their own without massive government subsidy. They simply do not provide energy on demand or otherwise at a competitive price. They have been a massive redistribution of wealth to foreign countries (mainly Communist China) and the office holder's cronies. Coal was savaged as a payoff to the radical environmentalists. Elections have consequences. When a person, never vetted, is elected this is what happens. LOL at your absurd comment Organizer. Silly political hogwash. Pull your head out! Turn off CNN! Purpose to start learning and not just repeating. It will open up a whole new world to you when you think for yourself. Too bad for jp5, all that pot he smokes "smoked" his bran cells long ago. He's beyond help now.